I grew up in one of the most beautiful cities in the world – Cape Town, South Africa. The birdlife in the Cape is nothing short of spectacular, with a healthy dose of charismatic endemic species. In fact, there is no other region in Africa that offers such a fantastic level of endemism in such an accessible location. Over 40 species of South African endemics can be found in the Cape – Cape Sugarbirds, Cape Rockjumpers, Orange-breasted Sunbirds to name but a few. But there is one Cape bird that stands head and shoulders above the rest when it comes to character – the African Penguin. And I recently returned to my home-town to get reacquainted with these little beauties. Formerly known as Jackass Penguins, a reference to their strange braying calls, African Penguins have become the unofficial mascots of marine conservation in the region. Their numbers have declined so rapidly that a paltry 10 percent of the pre-20th century population remains (read Adam Riley’s post on Africa’s endangered species). The early threats of guano harvesting and egg collecting have been replaced by the more ominous threats of oil pollution and overfishing of their favorite food source – pilchards. But their endangered status is belied by the fact that they are one of the easiest rare birds to find in Africa. 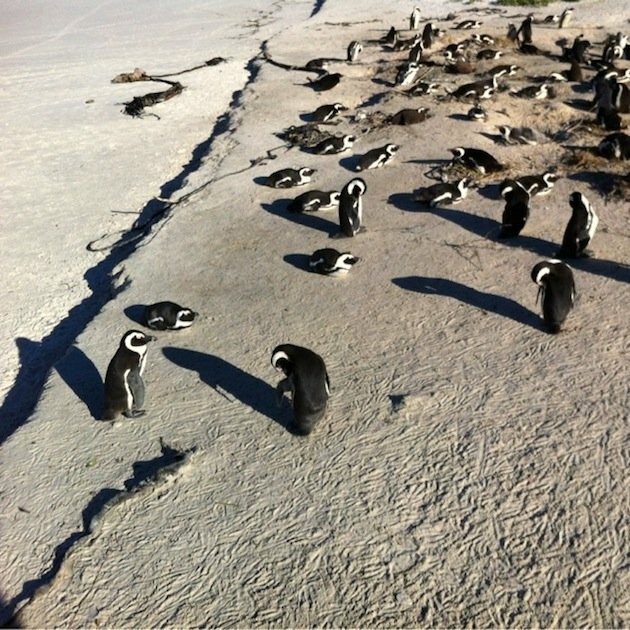 All it takes is a trip to Boulders Beach in Cape Town to get up close and personal with these comical penguins. 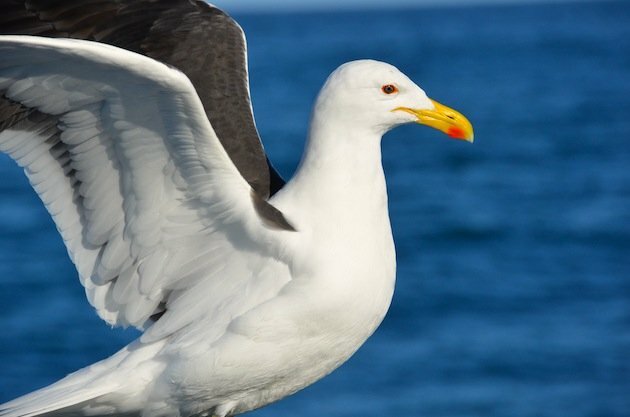 When I was a young child in Cape Town, these birds could not easily be seen from the mainland and one had to take a trip to one of the offshore islands to get good views of penguins. But in the early 1980s something remarkable happened. 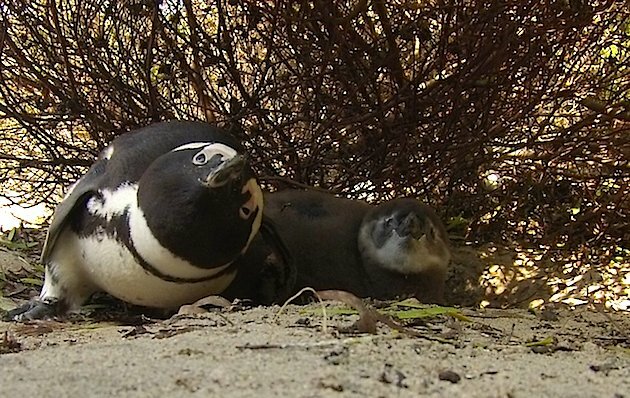 A pair of birds nested at Boulders Beach for the first time. These pioneers were soon followed by others and I remember swimming in the crystal clear waters with these incredible creatures. Today, there are more than 3,000 birds at this accessible colony and they are protected by fences and stiff fines for human disturbance. Although African Penguins can live upwards of 25 years in the wild, they face a tough life evading predators. On the mainland they face predation from domestic cats, dogs, genets, mongoose and Cape Gulls which steal their chicks and eggs. The only other significant mainland breeding colony is based about an hour out of Cape Town on the east coast at a place called Betty’s Bay. Its interesting to note that this colony was started concurrently with the Boulders Beach colony and was also pioneered by a single couple. Remarkably, this growing colony suffered severe losses from a leopard that habitually came down from the mountains to feast on the easy penguin snacks. In recent years on two subsequent December nights, this single leopard killed 65 penguins, only feasting on a small percentage of the carcasses. Thanks to fencing off of the breeding area, attacks from land predators have declined and now all four of the local cormorant species can also be found breeding at the colony. Obviously, the penguins are more vulnerable on land, hence their propensity to nest on offshore islands. But, although they are extremely agile and quick swimmers, they are not out of danger when they enter the water. 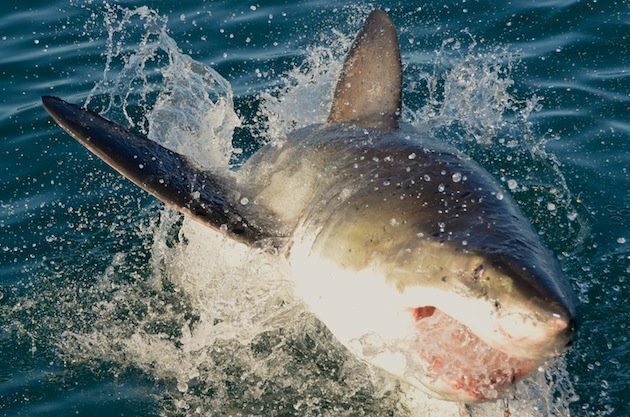 Sharks, Cape Fur Seals and even Killer Whales will prey on them in the ocean. To combat this, African Penguins exhibit something called counter-shading, a form of camouflage where the penguins look light from below and dark from above, a very useful deception when swimming in the predator-rich oceans of the Cape. 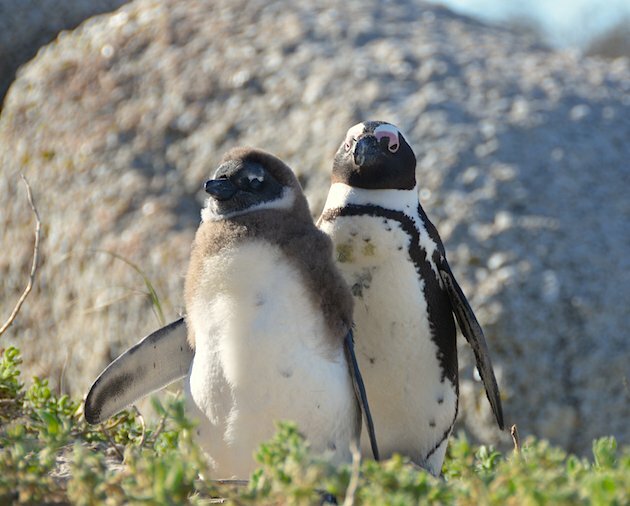 It is when they are breeding that African Penguins are at their most endearing. I was fortunate enough to visit both mainland colonies this past month and was blown away by the growth of both these colonies since I last visited nearly seven years ago. African Penguins are monogamous, with pairs remaining together for as long as they both live. The pair are extremely site faithful within the colony and will breed in the same burrow year after year as long as conditions remain favorable. These penguins have an extended breeding season with activity peaking between March and May. 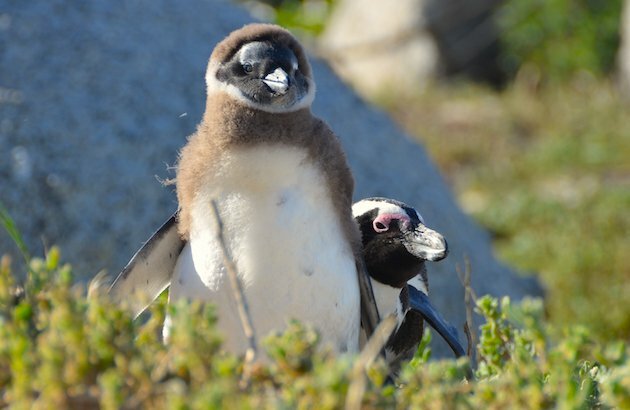 Even in late June, when I was down in Cape Town, there were many pairs with young chicks. It was heartening to witness first-hand the growth of both these colonies and the conservation and tourism initiatives surrounding these important breeding sites. But its also important to highlight the critical danger that these birds currently find themselves in. Consider the following facts: The African Penguin population has declined by over 90% in just 100 years. From 1978 to 2008 the Namibian population declined from 12,162 pairs to 4,563 pairs. In 1979 the South African population was estimated at 56,900 pairs. In 2009 the population was recorded as 20,699 pairs. This represents a 61% decline In the last 28 years alone. Please enjoy the below video that I compiled featuring some of these birds at both mainland colonies.